Stoke Holy Cross parish is situated immediately south of the Roman town of Venta Icenorum, and straddles the River Tas. It contains the settlements of Stoke Holy Cross, Upper Stoke and Dunston. 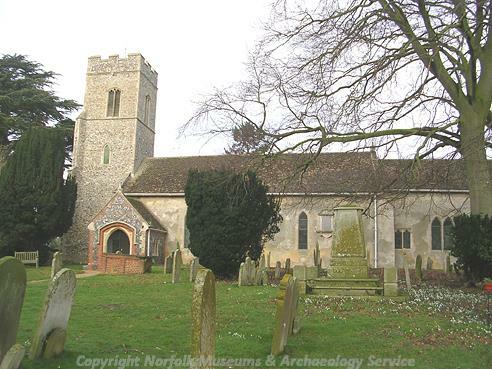 It is a large parish with an area of some 923 hectares, and is situated in the South Norfolk Local Government district. The name ‘Stoke’ is thought to derive from Old English, and may mean place, religious place, or dependant farm. ‘Holy Cross’ refers to the dedication of the church. The name ‘Dunston is also thought to derive from Old English, probably from the words for Dunn’s enclosure. The earliest recorded object is a Palaeolithic or Mesolithic long blade core (NHER 28430). Other very early objects include five pot boiler sites (NHER 29734, NHER 29736, NHER 33106, NHER 33104, NHER 33108), which date from part of the prehistoric period. Slightly later, but still as many as 10,000 years before the present day, are a number of Mesolithic flint implements (NHER 11498), a Mesolithic flaked axehead (NHER 13419), and a microlith (NHER 28431). Of greater density are objects from the Neolithic period, which have been found as over twenty separate sites. These include scrapers (NHER 9727, NHER 9728, NHER 19769), axeheads (NHER 9730, NHER 19220, NHER 22917) and a stone axehead (NHER 20533), as well as an Early Neolithic arrowhead (NHER 49854) and a leaf arrowhead (NHER 43927). 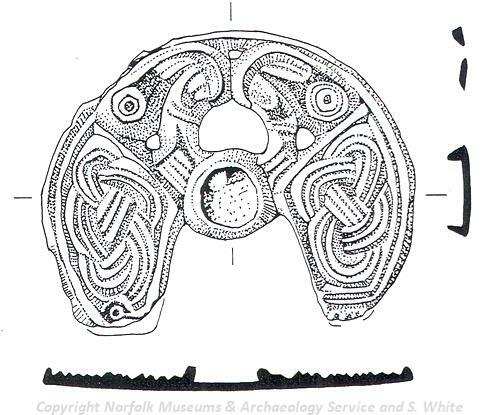 The earliest recorded monuments are four possible Bronze Age ring ditches (NHER 11716, NHER 9757). These include one situated close by a later Roman road (NHER 5092), as well as four possible ring ditches situated in an area of dense activity and possible Roman religious use. There are also four possible Iron Age sites recorded. Of these one (NHER 31858) may be evidence of continued activity from the Bronze Age through to the Iron Age, with pits and post holes recorded. Only one of these (NHER 31856), a quarry site situated close to Dunston village, has activity only during the Iron Age. Both the other sites so far discovered have continuing activity into the Roman period (NHER 31820), and perhaps beyond into the Early Saxon period (NHER 31821). Objects recovered from other areas across the parish comprise two terret fragments (NHER 22957, NHER 28173), coins (NHER 24332, NHER 39624), some pottery sherds (NHER 33104), and a glass bead (NHER 39624). With the proximity of Venta Icenorum it is not surprising that a number of Roman sites have been recorded here. These include two possible Roman roads (NHER 5092, NHER 9863), as well as possible Roman cremation burials (NHER 9737). A possible Roman villa situated east of the village of Stoke Holy Cross was identified by aerial photography and geophysical survey, and limited excavation in 1999 recovered Roman tegulae and dense scatters of other roof tile. Also of possible Roman date are a complex cropmark site (NHER 9743) in the very north of the parish, as well as a number of pits and postholes which may for a palisade or building (NHER 31820), situated near Dunston. A number of Roman objects have also been recovered from across the parish, including coins from emperors such as Hadrian (NHER 24450) and Lucius Verus (NHER 30476). Pottery sherds have also been recovered in number (NHER 20019, NHER 20195), and a possible kiln site has also been noted (NHER 34698). Metal objects such as bracelet fragments (NHER 28173), a ring (NHER 24332), brooch (NHER 37495) and pin (NHER 33104) have also been found. As well as some possible continuation of occupation into the Early Saxon period in the area of the golf course (NHER 31821), a possible Early Saxon inhumation was discovered in 2005 (NHER 41735). Dating was provided by some associated Early Saxon pottery sherds. 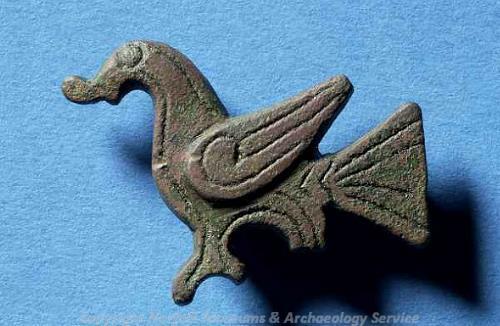 Pottery sherds from the Saxon periods have also been recovered from areas across the parish (NHER 13419), as well as some exciting objects including an Early Saxon glit copper alloy plaque (NHER 24925), a Late Saxon Ringerike style cast mount (NHER 23778), and a Ringerike style brooch (NHER 24332). The settlement of Stoke is also listed in the Domesday Book, and although the area is not valued highly it was populous, and had its own church. This likely to have been on the same site as the present church, which is dedicated to the Holy Cross (NHER 5091). The present day church is largely the product of a heavy rebuilding in 1879, but it does retain a 14th century tower and it is thought that the form of the chancel east window is faithful to the original. The settlement of Dunston is also listed, although the current church of St Remigius (NHER 9768) is not mentioned. The present church building is small and has a chancel and north doorway in the Early English style. Unconventionally it is this doorway that the church is entered through. The west tower is in the Decorated style, as is the nave, in which a 15th century rood screen survives as well as fragments of early stained glass dating to around 1300. Stoke Holy Cross also has a surviving medieval chapel which was originally part of a medieval manorial site and now forms part of a Blackford Hall (NHER 9908). The Hall is known to have been called Blackworth in the 14th century, when a licence to crenellate was granted, and sits in a moated area which was owned by the D’Oyley family. The current house dates to the 18th century, but the east-to-west building is thought to be the remains of a chapel dating to around 1300. A small number of other medieval sites are also recorded, comprising the earthworks of possible medieval tofts (NHER 9769), possible medieval enclosures and hollow ways (NHER 14240), another moated site (NHER 9745) and possible medieval building remains (NHER 9739). Very little is visible of these ties, and the location of another important site, the moot hill for the Hundred of Henstead (NHER 17911) is also unknown. Objects from the medieval and post medieval periods have also been retrieved from the parish. These include a number of pottery sherds (NHER 13419) and coins (NHER 9733), as well as everyday objects such as buckles and harness pieces (NHER 24511) and mounts (NHER 21355, NHER 24332). More interesting objects include part of a dispersed hoard (NHER 41093) which was recovered in 2004 and contained coins and a gold signet ring and gold finger ring. A silver medieval brooch (NHER 9734) has also been found, as well as a 14th century copper alloy seal matrix and a papal bull of Lucius III (NHER 39931). It is also known that a mill was present at Stoke during the medieval period. The current building (NHER 9773) on this site dates to 1747, and was significantly rebuilt in 1853 following a serious fire. It is a large structure with a brick base, and has seen use as a paper, flour and mustard mill. Between 1814 to 1862 it was the major mill of the Colman family, and is still one of the largest mills in the county. 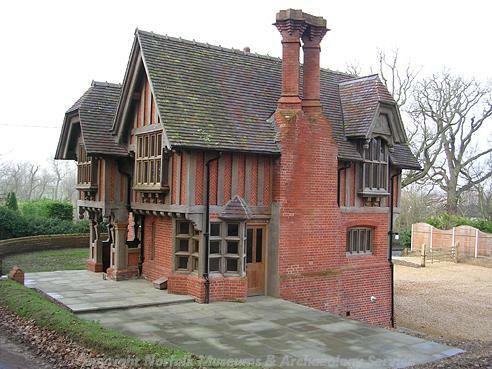 One of the other most substantial buildings in the parish is Dunston Hall (NHER 9764). Despite its Elizabethan appearance this large brick building was actually started in 1859 by J C Buckler and finished in 1878 by Boardman. It is currently in use as a hotel and golf resort, but at least two earlier post medieval halls are known to have stood on this site. Unfortunately Stoke Hall (NHER 9766) does not compare, having been substantially demolished in 1937, and only the stable block and tower are thought to survive. However, there are a small number of other post medieval buildings of note, and these include Rummer Inn (NHER 5413), a 17th century brick building with two finely shaped gables. Also of interest are Dunston Manor (NHER 14611), which is of chequered brick and dates to around 1710, and The End House (NHER 14613) which is a timber-framed house on a cross-passage plan which appears to date to the late 16th century. World War Two also left its mark on the parish, with a number of defensive features such as pillboxes (NHER 5093), ammunition stores (NHER 32868) and anti-aircraft guns (NHER 40100) known to have been situated here. From more recent history, the Royal Observer Corps also had a post (NHER 5092) close to Caistor St Edmunds, which was operational between June 1960 and October 1968.